In college, some students think getting ready for class means throwing all of their textbooks in a backpack and rushing out of their college dorm room. But something's missing here. Before you rush out of your college dorm room, you obviously need to do your makeup! When shopping for your college dorm essentials, you may have overlooked the fact that there's no bathroom in your dorm room. But don't let your mascara run just yet, because with the right college supplies, you can make your own luxurious bathroom vanity right on top of your dorm room desk. Mirror, Mirror on the dorm desk? 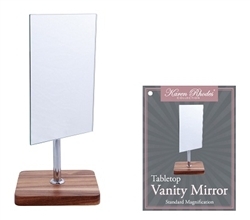 While you may not be able to have a full-sized bathroom mirror in your college dorm room, you can use any of our Standard Mirrors to complete your morning dorm room makeup routine. College dorm room desks are not very big, so adding a powerful, upright, and compact mirror to your college survival kit is a must. Avoiding Cosmetic Calamities. Thanks to the size of college dorm rooms, the days of spreading all 10 of your eye shadows and mascaras on the counter are unfortunately over. Instead of getting rid of some of your beauty products (what college girl wants to do that? 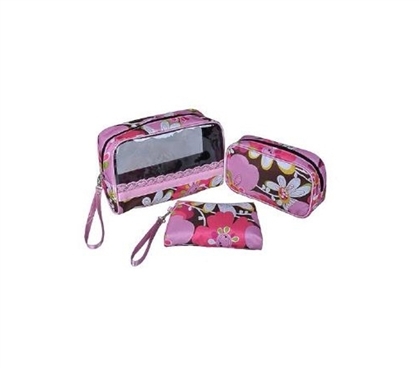 ), try using our Pink/Chocolate Floral 3 Piece Cosmetic Bag set. It's cute, it's compact, and it's just the right size to fit neatly on your dorm room desk. Dorm essentials that are also makeup essentials are always a win-win. Dorm room cosmetic bags are perfect for holding your eyeliner and blush, but what about the larger beauty supplies you'll use every day in your dorm room? When you're rushed in the morning and your dorm room is a mess, the last thing you want to do is dig through your makeup bag for a blush brush. 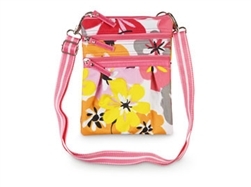 With our Dorm Crossbody Bag, all of your dorm makeup must-haves will be right at your fingertips. It's one thing if you've lost one of your favorite t-shirts in your dorm room, but no college girl is happy when she can't find her hairbrush or eyeliner pencil. With a Crossbody Bag holding your dorm room accessories, doing your makeup and getting to class on time is completely possible.